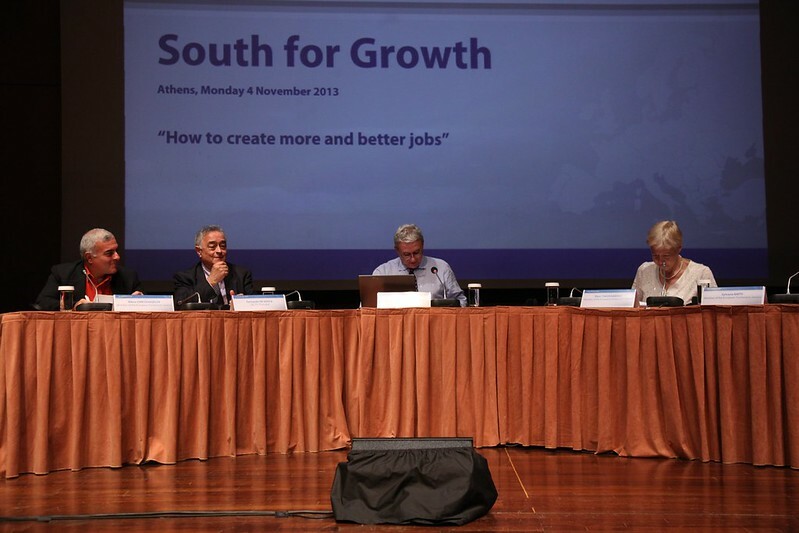 Europe has to put as its first priority the creation of sustainable and innovative jobs. It is unacceptable the current rate of the unemployment, especially youth unemployment. In the southern countries youth unemployment is very high, 60% in Greece for example, but below 10% in Germany. This demonstrates that we are living with an asymmetric, supranational, crisis. However, we are still trying to respond to it on national terms, without proper tools. Member States policies in south only make matters worse at the moment. financial crisis and austerities measures which increase the unemployment. We are forcing upon "troika" countries cuts in education and social programs directed at the youth, when expenditure in education or supporting start up companies should not be treated the same as any other expenditure. The Commission, the European Central Bank, and the rest of the troika must take account of this rather than asking for more and more cuts. Real reforms towards social and ecological sustainability, investments in the frame of a Green Social New Deal rich of job and an increase of the efficiency of the administration, with the participation of the citizens and the stakeholders, could be the alternative to the current austerity policies for the exit of the crisis. The message "You must try harder and we'll make a small effort to help you try harder" is not what young people need to hear. It ignores the fact that there are simply not enough jobs, which is due to poor policy-making as well as young people's lack of a say in the policies affecting their lives. They need to hear that we support them and that we will reform policies to ensure that they too can benefit from decent employment and living standards: jobs, rights and opportunities. But on 12 September MEPs sent mixed messages to young people across Europe suffering from the effects of the crisis. A generation in crisis came before MEPs in two reports, one on Youth Unemployment and another on the implementation of the Youth Strategy (2010-2012). Seeing the report on Youth Unemployment as a step backward and ignoring the fact that there are simply not enough jobs, the Greens put forward their alternative. The Green concept was that Member States and the EU should go further and look at quality job creation for young people with full respect of their human rights and immediately end any measures which are counterproductive to youth employment. This was unfortunately rejected by MEPs, leaving the Youth Guarantee and other policies to stumble form the effects of chronic underfunding. On the Youth Strategy, MEPs made clear the disastrous consequences of austerity measures in the fields of education, with Member States imposing cuts that hinder the development of long term routes out of the crisis. The strategy was divided into 3 working cycles. The first cycle prioritised cooperation between Member States, with youth employability, entrepreneurship and the promotion of youth participation as the main topics. The new cycle (2013-2015) continues to focus on youth employment and is especially concerned with young people crossing the poverty line, an increasing reality for many. Looking to the future, the challenges for the next cycle of the strategy consist mainly in making sure that all stakeholders participate in the general effort; youth associations and civil society must be included in decision making processes and also in working on the most difficult phase of the education-to-work transition. Policies must be consistent and visionary to give the necessary push in fostering all types of transversal, social and creative skills. They must also integrate non formal and informal education into a general approach of "quality education scheme" and "quality apprenticeships". We must not forget the role that youth has to play in a democratic and participative society, confronting extremism and radicalism and shaping their own future. In a nutshell the focus on young people must be a mainstreamed priority in all EU programmes under the future European budget 2014-2020 (MFF). On June 11th, the tvn co-presidents of The Greens in EP, DCB and RH sent a letter toi J.M.Barroso calling for a developing the social dimension of the EMU and strengthen the fundamentals of the monetary union which must be built on solid democratic grounds and the community method. They call on him, in close cooperation with the EP to put social and employment indicators at the heart of economic governance by revising the Macroeconomic Imbalances Procedure. The Greens have been to the fore in advocating a binding Youth Guarantee to address the problem of youth unemployment. It is crucial that the EU put as a priority the fight against poverty and youth unemploymentunder its social programmes. This is a fight that the Greens will keep up in the European Parliament and during the European elections next year. It is not only unemployment that contributes to social exclusion. More and more people have a job but they can’t survive easily. Having a job is not enough anymore for combating the poverty. We need also policies for reducing poverty. The good news is that the European Parliament and Council reached an agreement on 1st October 2013 on the European Social Fund for 2014-20. This agreement will ensure that measures to reduce poverty and tackle youth unemployment will get greater priority under the European Social Fund. The European Parliament pushed for and ensured greater space for poverty reduction measures, both in terms of funding and in terms of content. 20% of ESF funding will have to be allocated to poverty reduction. In the future, the ESF will be able to support projects that tackle the root causes of poverty and not simply projects aimed at labour market participation. This is vital for ensuring European funds can help people affected by poverty, who are at a distance from the labour market, like children and the elderly. We were also able to ensure that refugees and asylum seekers will once again be eligible for assistance through ESF programmes, in spite of opposition to this from the EU Commission and national governments. This will also help the overall goal of poverty reduction and build on positive experiences in some member states. We urgently need to tackle youth unemployment nowand it must be done correctly. We need to immediately end these destructive austerity measures that are increasing youth unemployment and social exclusion; we need to focus on job creation but without forgetting the qualitative aspect of decent work and rights at work, especially in times of high crisis and especially for young people. And we cannot afford to exclude young stakeholders from the policy making that is affecting them: We need to give youth a key role in defining the strategies. We need to empower young people to overcome the effects of the economic crisis. We strive for policies of, by and for young people that let them reclaim their future and guarantee their participation in our societies. More generally speaking, the macroeconomic and financial program of the European Greens is the Green New Deal. We have developed it as an alternative for the current economic situation, given thebankruptcy of the current economic and financial system, which is characterised by its instability and imbalances, where repeated crises seem to be the only form of regulation. The current economic crisis is a perfect example of this instability and imbalances, therefore it reveals the failure of policies driven by what can be defined as neoliberal thinking. The Green New Deal includes a sustainable economic policy that improves the quality of life, a redefinition of the European budgetary and monetary policy and a new global monetary system. This means that: First, the implementation of the Green New Deal calls for a new direction of economic policy aimed at reducing our carbon footprint and improving our quality of life. Redefining objectives of economic policy will bring forward new economic indicators to steer and evaluate policies. Second, the implementation of the Green New Deal will force a redefinition of budgetary and monetary policy at European level. Ultimately, the Green New Deal will hold even more promise in the context of a globally organised monetary system that helps guarantee of stability for northern and southern economies. This Green New Deal is our comprehensive view on how we want to develop our society towards a sustainable social, financial and economic society. And it’s really a sustainable alternative.